On Friday, a blog post by Mridu Khullar Relph put me in a contemplative mood. One of her great lines from the post is: “The writing life is full of surprises, some of them good, and some of them upsetting.” To me, the upsetting part of a writing plan may be when you find a speed bump (or two) in the path you've decided to take. No matter how we try, our writing life may not follow the plan we had set for it. Recently I had a chance to experience a couple bumps I hadn't expected. Last year I wrote the gluten-free eating book and was thrilled with the experience. Capitalizing on the momentum I was feeling, I focused on some fiction I've had rattling around in my head. I expected I would be able to write another book and looked forward to completing it. This spring, I was contacted to write another book for the same publisher. I put the fiction aside and hit the ground running. I Googled. I went to the library. I started checking out books on the book's subject. I downloaded medical reports. I visualized writing the book and following the same pattern that worked so well last year. And then I looked at my life. Really looked at it. I looked at it more than just clearing the proposed deadline date in my calendar. There was too much going on in my life as it is: My mother-in-law and ailing father-in-law have moved to town. I have a different, more demanding job than I had last year. I accepted several teaching gigs this summer, which I had rarely done before. I'm traveling a bit in the next couple months. And I wanted to relax and explore new avenues, such as recipe development. So, I returned the books to the library. Recycled the medical reports I had printed. I removed my name from consideration and scratched my name off the imaginary byline I had already envisioned. While I enjoy writing and think the book would have been a great challenge, I'm glad I made the decision I did. I’m picking the fiction up, albeit a slower pace than previously, and spending quality time with my in-laws. I’m just trying to enjoy my life right now, even if I've hit a speed bump in my writing plans. Do you make plans with your writing life? How well do they pan out? 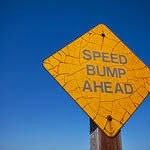 What do you do when you hit a speed bump? Elizabeth King Humphrey is a writer and editor living in coastal North Carolina. When she’s not at her computer, she is happily playing in her kitchen. Elizabeth--I think our writing is like the ocean. (Or, at least MINE is.) There's ebb and flow to consider. Sometimes our writing is at high tide--lots of words, lots of projects, lots of productivity. Other times, our writing is at low tide. Not much time or not much inspiration. Things--sometimes ugly things, sometimes fascinating and alluring things--float in close enough for us to grab onto. If a writer doesn't take the time to live or doesn't find some balance between their writing and the "stuff" that makes up their life, I think their writing suffers. Enjoy your in-laws, enjoy the recipe work and enjoy the fiction writing you're doing...'cause soon, it will be high tide again. It's an honor that the publisher asked you to write another book! It means you did a great job, and you are smart for knowing that at this point, you can't enjoy life and still get the work done. You did a smart thing that we can all learn from.